There are over 800 species and 2,000 varieties of ficus. Their natural habitat tends to be the moist forests found across the tropics and sub-tropics, mainly in parts of Asia and Africa, but also in South America and Australia. In their natural surroundings they can live to over 500 years. We at Decorfolia use a wide range of ficus. 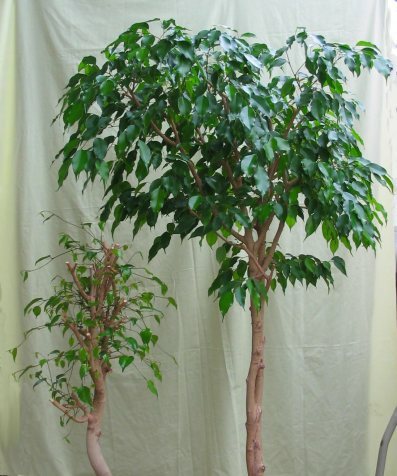 The common house plant types include Ficus benjamina with a variety of decorative stems. the popular rubber plant (ficus elastica) and various forms of the weeping fig with variegated and interesting shaped leaves. 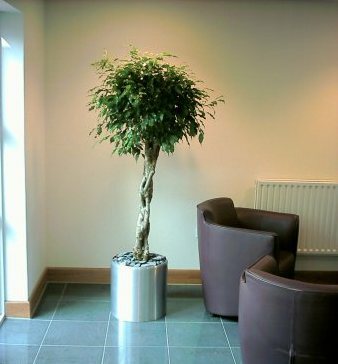 One of the most frequent questions the Decorfolia team is asked is 'Why has my ficus at home lost it's leaves?'. Leaf drop on a rubber plant is often the result of over-watering, but can also be caused by low temperatures, too little light, too much feed and cold draughts. Watering with cold water can also trigger leaf drop. Indeed, as a general rule always use room-temperature water when watering your house plants. Cold water straight from the tap can cause a plant to go into shock. Leaf drop on the weeping fig is a very common sight. If your plant at home starts shedding leaves like there's no tomorrow don't panic! The ficus benjamina is a sensitive soul and any change in it's surrounding environment can trigger leaf drop. This leaf drop is essentially a survival mechanism, used to save energy when the plant is under stress. Lower temperatures, light levels and cold or hot draughts can all result in plant stress. The key to a happy, healthy ficus benjamina is keeping it's environment consistent, so choosing the right location for your plant is essential. (Remember this if you are buying a plant - a good retailer should provide a plastic sleeve to protect the vulnerable foliage on the journey home). Choose a position where the plant gets plenty of light, but avoid direct summer sun through glass. Be aware of your plant's proximity to potential stress triggers - doorways, open windows, radiators. Choose a position which minimises the risk of fluctuating temperatures and draughts. Plants grow best in relatively warm temperatures (18-25ºC) and will tolerate a low of 13ºC during winter months. Ideally the growing medium should be allowed to dry slightly between watering. Most importantly, once a plant is in position try not to move it. A newly installed ficus benjamina will often shed leaves to begin with as moving home takes up nearly all the plant's energy. As it gradually acclimatises to it's new location it should settle and begin to leaf up again. Be very careful when pruning ficus as the sap is an irritant and can burn your skin, it will also mark carpets and upholstery.